Ms. Libertad Cal has the privilege of having this tree right in front of her yard. After Hurricane Earl took down our favorite birding tree, our “Giving Tree,” we began to pay more attention to the ceiba tree that had been hiding behind, but stood strong through the storm. This particular tree is rooted at the base of the hill below us which gives us the unusual perspective of a peek into the upper branches of this fascinating tree. Over time we watched the tree drop its leaves, then bloom with delicate pink flowers that attracted many kinds of birds and wildlife. We then watched the blooms turn to small buds, then larger pods that have now burst open, releasing puffs of cottony clouds, filled with seeds. We have seen squirrels and kinkajous feasting on the pods and birds taking the kapok for their nests. It strikes me how few seeds from this tree actually make it to a proper place for germination. At first the tree was bursting with flowers, thousands of them. Many of the flowers were eaten or knocked off before being allowed to progress to the next stage. Once the small buds evolved, they became irresistible to all manner of creatures. Those buds that survived the feasting and grew to maturity still had to fight off the squirrels and toucans who continued to eat them, sometimes taking entire pods and often dropping them to the ground. I finally understand why the Maya referred to this tree as the Tree of Life. At the center of the Maya World was a giant ceiba whose roots begin deep in the underworld and giant limbs reach toward the sky, branches large enough for animals to live in. 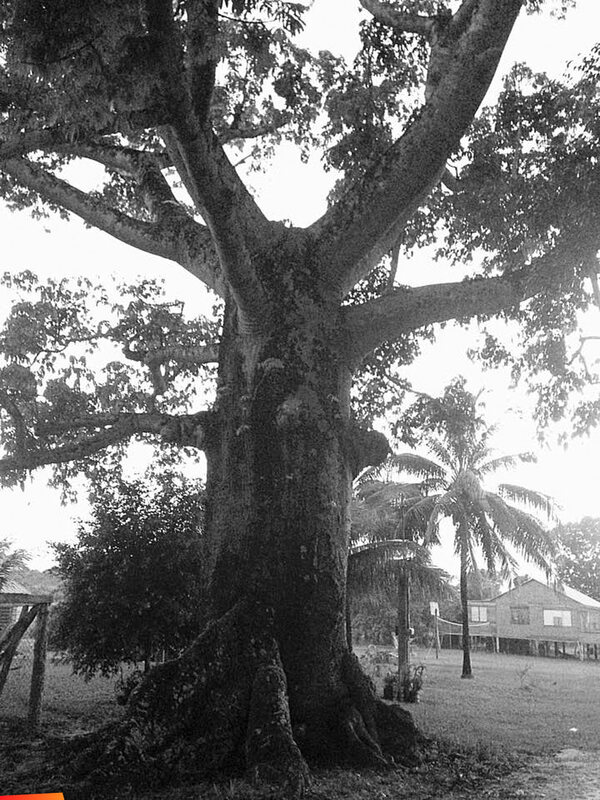 The tree providing food and shelter for many creatures, large and small, Ceiba pentandra, also known as cotton tree, is one of many ceiba species found in tropical areas around the world. C. pentandra produces the kapok fibers used in flotation devices and for stuffing mattresses and pillows long before synthetic fibers replaced them. The kapok fibers are also used in nests by birds and even squirrels. The oil from the seeds is nutritious and can be used to make soap. At the end of the fruiting cycle, the pods open up and release fluffy clouds carrying the seeds. It’s remarkable how many flowers the tree produces and in spite of thousands of seeds, we don’t see very many young ceiba trees. Perhaps it’s because the seeds are a source of protein for birds and animals. However once a seed does germinate and lives to be a young tree, it develops thick conical thorns which deter creatures from eating it. This emergent species can grow to over 200 feet, rising high above the tree line. You can see them in modern pastures, having been left behind as a sign of ancient respect, reminiscent of their cousins, the ancient and massive baobab trees of Africa. Regarding the flowering and fruiting process of the ceiba tree, it can take 5 years or longer to bloom. It always drops all its leaves before flowering. I was literally in the cat-bird’s seat for documenting a few moments in the life of this magnificent tree. The experience has taught me new- found respect for this mighty giant, this marvelous tree of life.